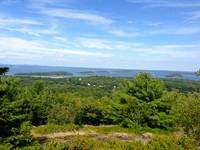 Mount Desert Island is home to the 35,000-acre Acadia National Park. 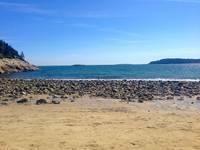 Established by Congress in 1919, Acadia was the first national park east of the Mississippi. 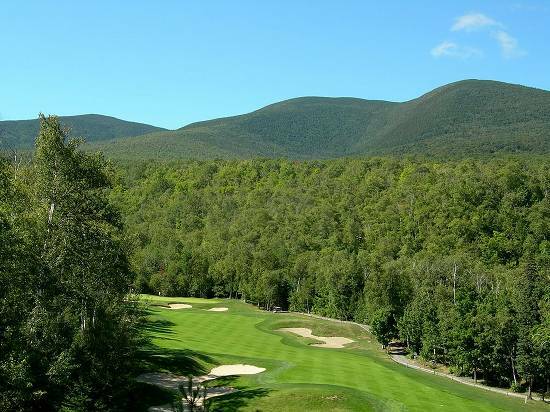 It is known for its wave-beaten shores with sandy and pebble beaches; picturesque harbour towns such as Bar Harbor; sparkling lakes; numerous mountains (of which the 1530 foot Cadillac Mountain is the most famous); and hundreds of miles of walking and cycling paths (like the Precipice Trail up Champlain Mountain). Mount Desert Island was named in 1604 by French explorer Samuel Champlain on account of the summits of its various mountains being devoid of trees. But the rest of Acadia has an abundance of spruce-fir (which dominated the park before a 1947 fire burned 10,000 acres), birch, aspen and oak. The list of Acadia’s fauna is extensive: birds include pileated woodpeckers, the American bald eagle, the peregrine falcon, and black-throated green warblers. Mammals such as red squirrels, moose, beavers, the brown bat, the black bear, the white-tailed deer and the red fox can also be seen. And there is a wide variety of ocean life which can be observed from Acadia’s shores – whale watching excursions and tide-pooling are popular activities, with lobster featuring heavily on every restaurant’s menu. There is a $20 entry fee to get into Acadia, which most choose to pay at the Hulls Cove Visitor Centre. If you do not fancy trying to find a parking space inside Acadia, there is a bus service from Hulls Cove, which gets busy from 3pm onwards. Acadia’s weather is best described as changeable. Summer highs average at between 70-80 F (spring/fall: 50-60 F; winter 0-30 F). Average annual snowfall is 60 inches. Bar Harbor is Acadia’s main town. Packed full of restaurants, coffee shops, clothes stores and hotels, it is anything but off the beaten track. 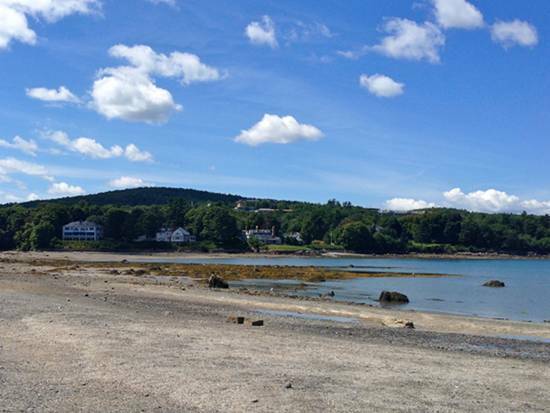 You won’t be alone if you take the 60-90 minute, 2-mile walk to the centre of Bar Island, Acadia’s most popular hike. On the other hand, the views back to Bar Harbor and out to sea are impressive. Note: this walk can only be undertaken a couple hours either side of low tide, when the Bar Harbor Tidal Path is passable. 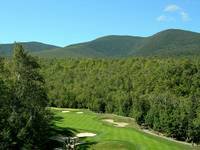 Another good walk from Bar Harbor is the Great Meadow Loop in pine forest and circumventing Bar Harbor’s golf course, which can be extended by taking the Jessup Path to the Sieur de Monts Spring (the extended walk takes up to 2 hours). Alternatively, head from the Great Meadow up Kebo Mountain (407 feet), for a more difficult 2.5 hour circular walk in beautiful forest. The last time we did this walk, we saw 2 other groups on the trail. For those after a trek, Cadillac Mountain—the eastern seaboard’s highest peak—must be the goal. There are a variety of routes to the summit. The North Ridge is the shorter of the two main routes, with a round-trip of about 4.5 miles. This will take fit hikers about 90 minutes in ascent and 60 minutes to return. The route follows a well-maintained track, provides sure footholds (often on rough granite slabs) and offers plenty of shade under spruce. There are a few moderately steep sections, but the trail is only of moderate difficulty. 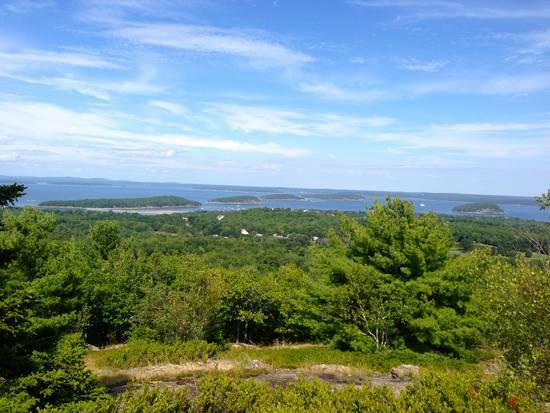 The views are remarkable, especially of Bar Harbor Island and the three Porcupine Islands to the east, and Sargant Mountain and Eagle Lake to the west. We suggest parking on the two-way road from the Hulls Visitor Centre, shortly before you reach the one-way scenic loop road. Cadillac Mountain’s South Ridge involves about 7 miles of walking. You pick up the trail from the entrance to Blackwoods Campground, initially passing through forest. The track becomes more exposed after about a mile, when the views to Otter Cove, the Featherbed glacial pond and out to sea unfurl. The walk is of again of moderate difficulty, with some scrambling on Acadia’s famous pink granite rock (given its characteristic colour by quartz crystal and pink feldspar). Many choose not to trek to Cadillac’s 470-metre summit, instead choosing to drive to the top. They can take the 30-minute stroll around the mountain’s plateau on a paved path. There are a number of displays containing information about the geology of the mountain, with the circular viewing area containing plaques highlighting points of interest visible on clear days such as the Turtle Islands, the Schoodic Peninsula and the Gulf of Maine. Cadillac Mountain is named after the 17th century French explorer, Antoine de la Mothe Cadillac. For those with mountain experience and a head for heights, thought should be given to the Precipice Trail. Ascending the east face of Champlain Mountain, the route involves almost 1,000 feet of steep ascent involving scrambling, easy climbing and ascent of fixed steel ladders. This is the Acadia National Park’s most famous trail. Note: check the National Parks Service website to ensure that the trail is open (it is closed from March each year until peregrine falcons stop nesting nearby). A good way to get introduced to Acadia is to drive the 27-mile Park Loop Road. This scenic route leaves from the Hulls Cove Visitor Centre and skirts the Sieur de Monts spring, Sand Beach, Thunder Hole, Otter Cliff and Otter Creek, the Jordan Pond and Eagle Lake. The route is one-way, so once you start you are committed to completing the whole circle. Take it slowly and stop to soak up the views! We recommend stopping at Thunder Hole, a small inlet carved into cliff rock at the south end of Mount Desert Island. When big waves roll into inlet, they expel air trapped in an underground cavern producing a noise that sounds like a clap of thunder: hence the name. Continue another .7 miles around the Loop Road to take in the 110-foot Otter Cliff and the views out to Sutton, Islesford and Great Cranberry Islands. Acadia has one sandy beach called, with a certain lack of imagination, Sand Beach. Swimming is possible there, but cold water and sea breezes put off all but the hardiest (the typical temperature is 55F/13C). Warmer water is found in Echo Lake, on Acadia’s western side. Acadia has a number of other ponds and lakes, but they are used in the water supply and so swimming is prohibited. Acadia contains a number of established climbing areas. Otter Cliff offers climbs of about 60 feet and pitches to grade 5.12. Routes of a similar difficulty are found on Champlain’s south wall, with more straightforward climbing at the Central Slabs, South Bubble and Great Head. 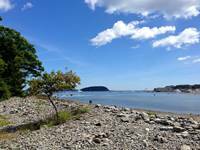 A range of whale watching excursions depart from Bar Harbor daily. 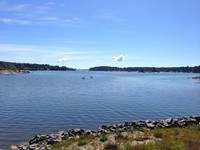 Other tours include puffin- and seabird-watching, and nature cruises around the numerous islets which surround Mount Desert Island. 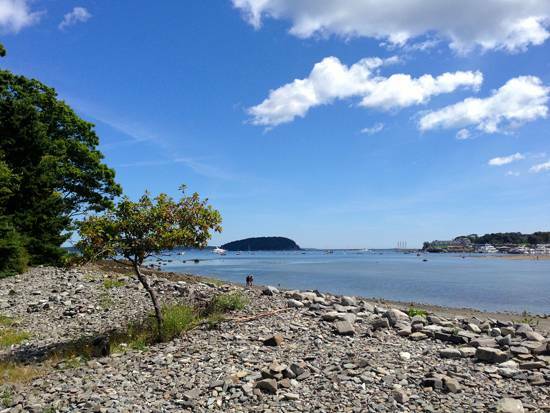 Finally, park rangers put on a number of educational talks and lead a number of nature walks each day—information is found at the Hulls Cove Visitor Centre.